Sugar Apple:Sugar Apple is a "Sweetsop". It is most widely cultivated of all the species of Annona, being grown widely throughout the tropicals and warmer subtropicals. It is a deciduous or semi-evergreen shrub or small tree with size of 8 m tall. The leaves are looks like simple, oblong-lanceolate, 7-12 cm long and 3-4 cm broad in length. The flowers are formed in clusters of 3-4, each flower, with six petals, yellow-green spotted purple at the bottom. Taste- The fruit is generally looks like a round in shape, a little pine cone-like 2.4-3.9 in diameter.There are variations in shape and size. 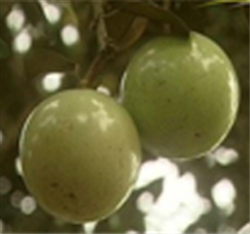 The fleshy fruit is very sweet to taste, white to light yellow, and resembles and tastes like custard. The edible portion coats of the seeds of this fruit generously like a gooey portion of a tomato seeds. Sugar-apple has a very discrete, sweet-smelling fragrance. It is a little grainy, a bit oily, very sweet and very soft. Look-The Sugar-apple, also called bullock's heart or bull's heart, is the fruit that tree is a family of Annon reticulata". This tree is a small deciduous or semi-evergreen tree sometimes it will reaches a high of 10 mtrs in tall and a native of the tropical that prefers low elevations, and a warm, humid climate.The fruits are always variable in shape, oblong, or irregular. The size ranges from 7 cm to 12 cm. When ripen the fruit it will become a brown or yellowish, with red highlights and a varying degree of reticulation, depending on variety. The flavor is sweet and pleasant. Custard apple is not only a tasty fruit, but also has got lot of nutrition in it. Custard apple is a rich source of vitamin A, B and C. Tabulated below is nutritional value per 100g of the edible portion of custard apple. Other than the vitamins and minerals given in the table custard apple also contains Calories around 80 g - 102 g and moisture around 68 g - 80.1 g.
Custard apple is rich in vitamin C which helps in neutralizing the free radicals in the body. 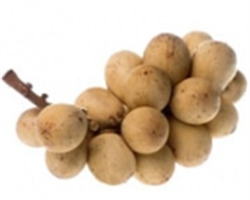 The vitamin A content in the fruit makes your skin and hair healthy and enhances vision. It is also rich in vitamin B6 and potassium. Magnesium which is present in custard apple helps in protecting the heart from cardio vascular diseases and relaxing the muscles. It equalizes the water balance in the body and helps to remove the acids from joints thereby reducing the problem of rheumatism and arthritis. The fruit also has copper and dietary fiber in abundance which is responsible for a healthy digestive tract and helps in digestion that avoids constipation. Low level of fat, cholesterol and sodium content in custard apple makes it good for health. Potassium present in it controls blood pressure and fights against muscle weakness thereby helping us to keep you fit.